Lord Abernethy, born John Alastair Cameron, became a Judge in 1992. He is a graduate of Oxford University (Pembroke College, MA) and an Honorary Fellow of Pembroke College. Lord Sutherland was the presiding judge at the Lockerbie trial, sitting with Lord Coulsfield and Lord MacLean. 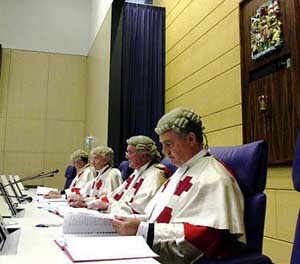 Lord Abernethy was an additional judge. He was called to the Bar (Inner Temple) in 1963 and in 1966 he was admitted to the Faculty of Advocates. He was appointed Queen’s Counsel in 1979. He was Vice-Dean of the Faculty of Advocates from 1983 to 1992. He was an Advocate Depute from 1972 to 1975 and served as Standing Junior Counsel to the Department of Energy (1976-79) and the Scottish Development Department (1978-79). He was a Legal Chairman of Pensions Appeal Tribunals for Scotland from 1979 to 1992 and President of the Tribunals from 1985 to 1992. Lord Abernethy is an active member of the International Bar Association. He was Chairman of the Association’s Judges’ Forum from 1994 to 1998. Since then he has been a council member of the Association’s Section on Legal Practice and its Human Rights Institute. He has been President of the Scottish Medico-Legal Society since 1996 and is the author of Medical Negligence: An Introduction (1983).